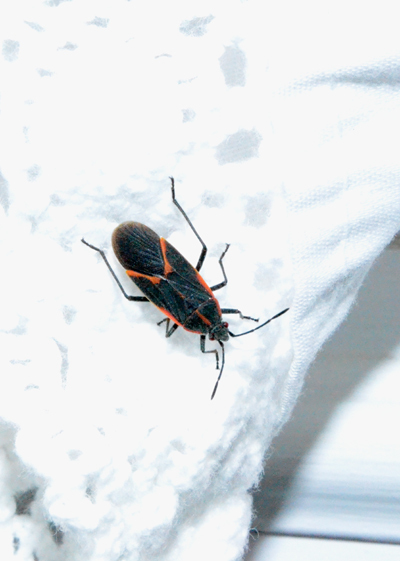 Little House Home Arts: Don't Kill the Box Elder Bugs! This season we have had an infestation of box elder bugs...For those that are not familiar with them, they are big and ugly and similar to beetles that crunch when you step on them. Just last night my oldest daughter related the worst experience of her life: when drinking a soda from a can, a box elder bug had crawled into the can and when she drank, she felt it go down her throat and then crawl back up!! How disgusting is that?!! I am glad that I wasn't there to witness it. I might have died or worse, made her panic such that she would have!! The other day I found one in the bottom of our new washing machine after I had put the load in the dryer!! I am checking to be sure that I have none in my shoes before I put them on each day!! I have a special rubber-thong-sandle fly swatter but we have made a new ruling...NO box elder bugs are to be killed! !....Squashing them makes too big a splotch, making it necessary to repaint or re-wall-paper!! So instead these ugly bugs are getting treated like an endangered species! They all are to be escorted out of the house or vacuumed up or are getting to live a long and natural life in our house!! Apparently they are not bugs that exterminators are allowed to kill for they are quite harmless... unless you drink them! Clearly the exterminators haven't had my daughter's experience! But I say that such a warning should be issued: No open soda or beer cans should be left unattended until box elder bug season is over!! Labels: Box Elder Bug Season; Box Elder Bug Warnings.